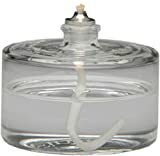 PRODUCT SPECIFICATIONS: The Firefly 3-Ounce Liquid Candle is hand blown and made from borosilicate glass; an elegant yet non-fragile glass. It stands about 2-1/8 inches tall to the tip of the wick and is about 2-1/2 inches in diameter. 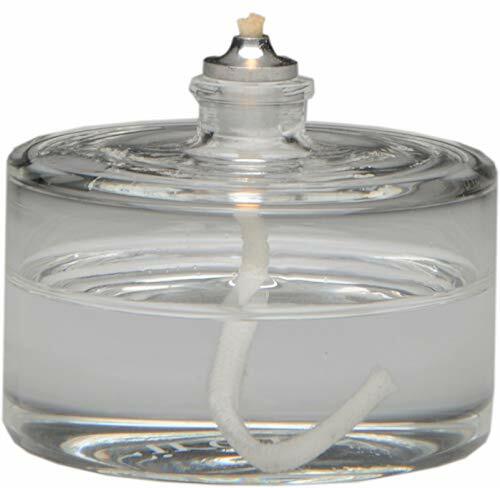 Because our glass candles are hand-blown, dimensions may vary by 1/16". If placing in a votive, please measure your votive to make sure it will fit. FUEL IS NOT INCLUDED. REFILL & REUSE: Our liquid candles are refillable which is the latest eco-friendly trend restaurants, event planners and the hospitality industry are using as a direct replacement of disposable liquid paraffin candles, aka, fuel cells. You know those nasty plastic candles that hide in candle holders and end up in our landfills! REFILLABLE EMERGENCY CANDLES - Firefly Oil Candles are an essential part of their preparedness kit. Bulk purchasing is a great idea because you can use the liquid candles all over your home every day, not just for those special 3-day outages! The votives will fit nicely in most candle holders and lanterns. MORE ECONOMICAL: Fill the votives with Firefly Liquid Paraffin Lamp Oil. You can use a burn time of about 6 hours per ounce of fuel. The wick is ADJUSTABLE unlike the disposable emergency candles. This is a great feature which allows you to control the fuel usage and flame height. So, let's do the math, a 32-ounce bottle of paraffin lamp oil will burn for approximately 192 hours - 6 hours * 32 ounces. Sweet!